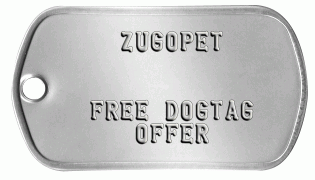 Patrons of ZuGoPet who purchase a ZuGo Pet bag, blanket or a harness will receive a free customizable mil-spec dogtag from MyDogtag.com. Makes an ideal ID tag for attaching to ZuGo Pet bag or your pet's collar! 1 stainless steel military style dogtag with your custom text. Choice of keychain or long aluminum ballchain necklace. Free Postal delivery directly to you within USA or Canada. You must first purchase a ZuGo Pet bag, blanket or a harness via ZuGoPet to obtain your unique promotional coupon code. Rows 4, 5 are fixed and cannot be customized. You cannot choose your style of dogtag, steel ball-chains, rubber silencers, or a second dogtag. If you need a complete set of fully customizable dogtags with all options please consider purchasing them from only $7.99. If you decide to purchase additional items with your ZuGoPet dogtag, a flat rate shipping fee of $5 will be applied. There are NO other hidden conditions or obligations for this offer. We will not sell or distribute any of your personal information. We may occasionally contact you via email to let you know about special offers which you can unsubscribe from at any time. Make your FREE 'ZuGoPet' Dogtag Now!